“We’ve seen a lot of things in the years, but never had people that didn’t have a heartbeat start talking to you,” said Oshkosh Wisconsin paramedic Rory Moxon in a video from Minneapolis’ Fox 6 news station. Moxon was describing the scene in a local hospital parking lot as the rescue team resuscitated a recent sudden cardiac arrest victim. The victim immediately came back to life when the squad used the newly FDA-approved CPR system ResQCPR. “It was freaky!” Moxon added. The ResQCPR system is one of the latest in technological advances in the CPR and First Aid training industry. (See more advances reviewed on the Beating Heart Center blog). As the ResQCPR system gains acceptance across the country’s Fire and EMS Rescue squads, more amazing life-saving stories are rolling in. The Montgomery County, Texas Police and Fire Departments responded to a 911 call about a single-car accident in September 2015. They arrived at the accident scene to find 62-year-old Dale Hardeman, a sudden cardiac arrest victim who had suffered an attack while driving home from a his weekly routine trip to the local hardware store. Over 300,000 sudden cardiac arrests happen out of the hospital each year, and most victims die from the attack. Dale Hardeman had the benefit of being rescued by rescue squad members who had recently completed their “go-live” training to use the ResQCPR system. Dale survived the sudden cardiac arrest, with their help, and spent only a week in the hospital before returning home to his everyday life. The device manufacturer, Zoll Medical, describes the ResQCPR as an improvement on traditional manual CPR. 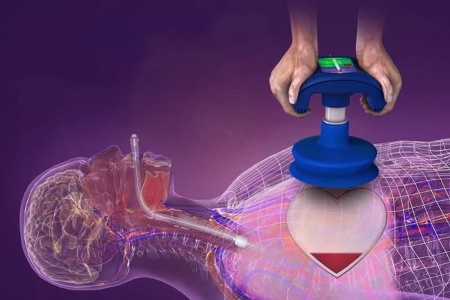 Data from the clinical trials presented to the FDA compared results from patients who received traditional CPR and those who were resuscitated using the ResQCPR system. Over 40 hospitals and almost 5,000 EMS personnel were participated in the study. A 52% increase in survival to hospital discharge rate with good neurological function and a 49% increase in one-year survival rate were reported in the results for those who received resuscitation using the ResQCPR device compared to convention manual CPR. The ResQPump is a hand-held suction cup chest compression device that is placed on the chest over the heart. It ensures the rescuer delivers the recommended American Heart Association compression depth (2”) and repetitions (80/min) as well as a suction strength that produces an active chest wall recoil; bringing more blood and air back into the heart. According to the Federal Drug Administration brief overview of ResQCP, “this is different than standard manual CPR where the first responder cannot physically pull up on the patient’s chest to deliver decompressions. The other device is an airway Threshold Device” (IPD) which fits onto a rescue face mask or breathing tube and enhances the vacuum needed to push more blood into the brain. 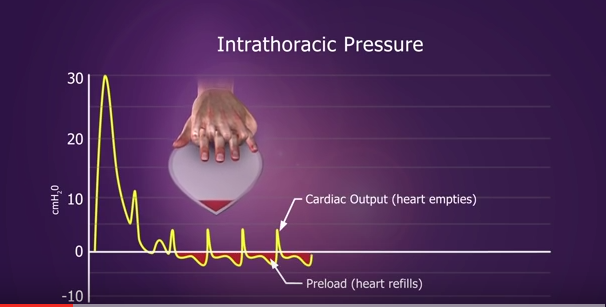 You can watch the new ResQCPR’s interior working mechanics in this video designed by the original manufacturer, Advanced Circulatory. Zoll Medical bought the start-up in December 2014. Keep up with the latest in CPR and First Aid response to out-of-hospital cardiac arrests by following the Beating Heart Center on Facebook. Their CPR and First Aid classes, featuring the latest in gamification training techniques and blended on-line and in-person learning are available every day of the week in the San Diego area.